Lot Detail - Doug Gilmour's 1996-97 Toronto Maple Leafs Game-Worn Captain's Jersey with His Signed LOA - MLG 65th Patch! - Photo-Matched! - His Last Maple Leafs Home Jersey! Doug Gilmour's 1996-97 Toronto Maple Leafs Game-Worn Captain's Jersey with His Signed LOA - MLG 65th Patch! - Photo-Matched! - His Last Maple Leafs Home Jersey! Spending six of his twenty NHL seasons in Toronto with the Maple Leafs along with a final game for the Blue and White at the conclusion of his career in 2002-03, Doug Gilmour helped lead the Leafs to the playoffs in four of those seasons, including in 1992-93 when the club advanced to the Conference finals. 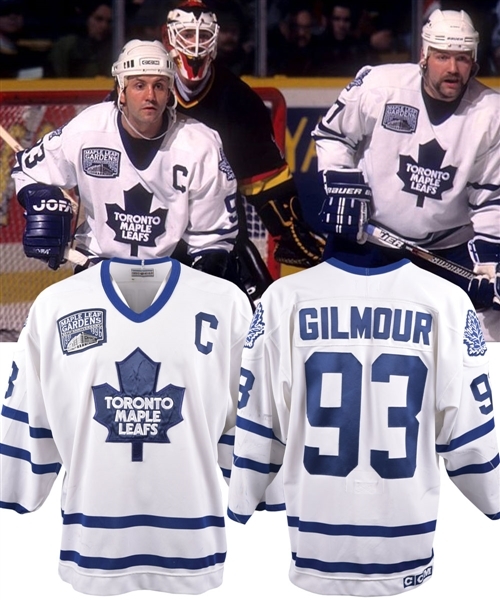 We have the last Leafs home jersey Gilmour wore, with this example photo-matched to the February 8th 1997 game at MLG, with just road games played before his trade to New Jersey, on Feb 25th 1997. A Center-Ice label sits along the collar near a size “54” fly tag, with embroidered NHL and CCM crests over the reverse bottom hem. Featuring the famous Maple Leafs team crest with “Toronto” embroidered, the white captain’s jersey has been accented with “93” over the sleeves and verso in single navy twill, with the MLG 65th anniversary crest just above the right breast. A signed LOA from Doug Gilmour will accompany. Also sporting custom-shortened sleeves, the jersey shows nice use, with numerous marks over the lower front and sleeves, along with blue paint transfer over the left elbow. There is also a large team repair over the left elbow. Getty Image #482535676 from Feb 8th 1997 has been matched to a number of black marks on the right sleeve, including the large example near the cuff.